Is your resolution for 2017 to get fit? Do you also want to spend as much time as possible exploring virtual reality? Good news - now you can achieve both goals thanks to Fitbit. The firm synonymous with fitness trackers unveiled a new partnership at CES 2017 that lets users log sessions on the VirZOOM VR bike as workouts. While you're immersed as an F1 driver, tank commander, or Pegasus, Fitbit will track these virtual excursions as if you are doing real-world training. Metrics like workout duration, distance pedaled and calories burned will be charted, as well as heart rate if you have an HR-monitoring Fitbit. As Fitbit notes, the team-up offers a gamified approach to exercise, which might be a welcome change of pace from your usual jogs. 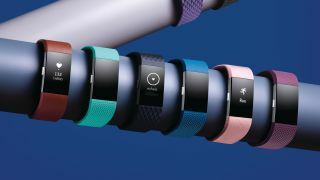 This is a first for Fitbit, as well as a first in the world of fitness trackers, though we doubt it will be the last. Of course, in addition to a Fitbit you'll need a VirZOOM bike and VR headset to take advantage of these features. A VirZOOM bike runs $399.99 on Amazon. The stationary cycle is compatible with HTC Vive, Oculus Rift and Sony PlayStation VR headsets, which range from $399.99 for PS VR up to $799.99 for the Vive. That's not the only news Fitbit shared in Las Vegas. The company announced two other partners joining the Works with Fitbit ecosystem: Habit and Peloton. Habit will essentially use your Fitbit data to churn out personalized food recommendations and nutrition plans. For example, if Habit sees you're not doing enough activity to reach a weight loss goal, it will rework its daily calorie recommendation and offer food suggestions to help you get there. And while not a VR bike, Peloton is a stationary cycle that will now sync directly to your Fitbit to track your workouts, perfect if you're stuck indoors during these chilly winter months.